Large - $49.99 X-Large - $49.99 Only 1 left! We've got a soft spot for the Robin Hood stories. Seriously. Nobility cast from his own castle, only to turn around and wreak havoc on the men who caused his aristocratic demise? Stealing from greedy government to give back to the over-taxed people? Hanging out around a bonfire in the woods with a bunch of guys who are so good-natured they're called "merry?" Sounds awesome to us. Then you get to throw in the whole damsel, evil sheriff, and bow-expert nonsense, and you've got one epic story. Epic enough that we've spent hours around the break room discussing who would be Maid Marion, Robin, Friar Tuck, and Little John (Bob over there is a shoe-in for Maid Marion). We've talked about company outings to go learn how to shoot a bow. We've discussed camping in the woods (though none of us have ever committed... we're not big campers). Regardless, you get the idea; we're fans. We're big enough fans that we want you to be a fan with us! Heck, you could even be Robin Hood if you wanted! We'd recommend coming in costume though (everything is better in costume). 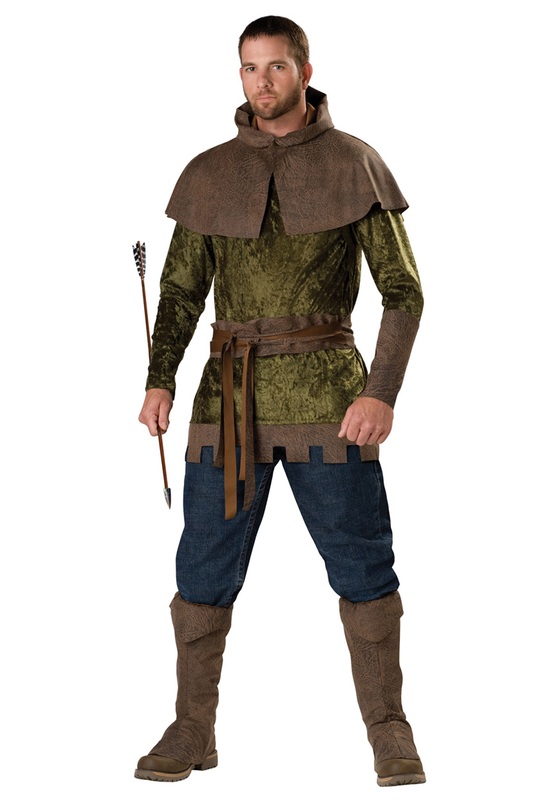 For instance, this Robin Hood Costume here. It's got a green crushed velvet tunic with a suede dagged hem. There's a faux suede cowl, a faux suede bracer, a belt, and even a pair of boot covers. Just get yourself a good pair of pants (or tights!) and a bow and you'll look perfect for robbing from the rich! Just one question: can we be your merry men?